I was not here in 1884 to protest our government’s banning of the Aboriginal potlatch ceremony which made criminals of people who were practicing an ancient culture. I was not here in 1885 to protest the extortionate Chinese head tax aimed at reducing Chinese immigration to Canada. I was not here in 1914 to protest when the ship, the Komagatu Maru, carrying 376 Asian immigrants was refused permission to dock in Vancouver because the exclusion laws of this land were “violated”. I was not here to work alongside all the non-white women who fought for decades, until the late 1940’s, for the right to vote after white women won that right in 1921. I was not here in 1942 when Canadians of Japanese descent, had their homes and businesses expropriated and were interned in the country of their birth. I was not part of many fights for civil and human rights here in Canada. When teachers here first began to fight for more funding for public education in B.C. in the 1980’s, I was living in South Africa. At the time the struggle against Apartheid had been ongoing for almost three decades. People of my skin colour were born into the fight for democracy, for full citizenship. At birth we were all “classified” into races. I was classified “coloured”. This meant that there was a limitation of my choices in life, but not as many as I would have experienced had I been classified ‘Native/Bantu’, a term used to refer to aboriginal Africans. Politically, it meant that I could not vote, since only White people could vote in parliamentary elections. Economically, it meant that I could only consider work and careers designated for me under laws that controlled access to employment for all ‘races’. Socially, it meant that I could only visit certain beaches, attend certain cinemas, ride on certain buses, eat in certain restaurants, enter post offices at certain entrances and sit on certain park benches, inconveniences shared by all non-Whites. Being born brown-skinned in a country whose government used the legislature to pass heinous laws that robbed people of basic human rights gave me a profound education in the use and abuse of political power. My experiences in South Africa provided me with a particular political lens through which I view the actions of the B.C. Liberal government. So much of what is done in the legislature in Victoria seems familiar. Politics here may not be as black and white as they were in South Africa but sometimes the laws that the BC Liberals pass seem like just a different shade of grey when compared to the laws passed in South Africa during Apartheid. And so, at a time when all South Africans enjoy the rights of full democratic citizenship, I find myself here, on the opposite side of the world, where democracy and civil rights are under attack. I find myself here at a time when workers’ rights, won over many struggles over a century ago, are in danger. I am here now, when the very concept of a free, equitable, public education system is being threatened. I am here now, one of thousands, making history for the textbooks of tomorrow. Students in the future will learn that a government in a democracy not only attempted to disregard two Supreme Court rulings but also the highest law in the land, the Charter of Rights and Freedom. 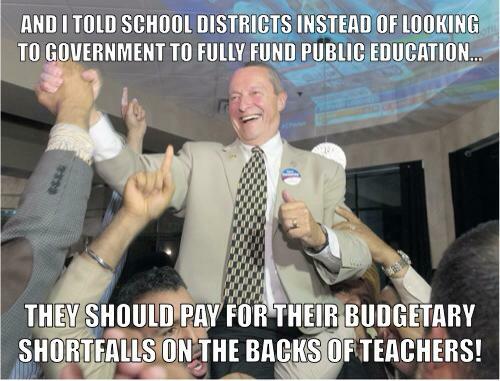 They will learn that over several decades, teachers in British Columbia fought to ensure there was a fully funded public education system. They will also learn of the particularly difficult fight that began in 2002 when the government attempted to eradicate the rights of teachers to negotiate the learning conditions of students and the working conditions of teachers. In South Africa I did not have a choice about which side I would be on in the struggle for justice. That was determined at birth. But here, in Canada, where all citizens in this province have a choice, I will one day be proud to say that I was on the side that fought to save public education from attempts to gut it financially. I was on the side that fought to save one of the most important pillars of democracy: an education system that provides for the needs of all citizens, not just those born into affluence. Yes, when I look back on my life someday, I will be able to say, I was also there then. Author Lizanne FosterPosted on June 17, 2014 July 6, 2014 Categories Education for the 21st centuryTags public education, social justiceLeave a comment on Which side are you on? Thank you so much for freeing up my weekends! I woke up this morning feeling so relieved that I won’t have to spend hours marking essays and projects thanks to the lockout! I will now have the time I don’t usually have to visit friends and to complete all my errands! My friends are so pleased that they’ll be able to spend time with me because they usually don’t see me at all except during holidays because I’m always too exhausted from a stressful work week or because I’ve got hundreds of essays and assignments to mark on weekends. I’m also relieved that I won’t be expected to contribute my thoughts about the new BC Education plan. I had been so excited to read about the new “learning environment” concept and had been spending time on weekends researching ways I could transform my classroom into a learning environment. But now I can free up my reading time for the many novels I have been meaning to read. I’m so looking forward to getting home early next week! Usually I’m still at work until 7pm. I’ve had many dinners in my classroom when I’ve had to plan lessons and prepare for the next day. But now that my afternoons are going to be free, I can use up that gym membership I’ve neglected. I’m going to be so much fitter by the end of the school year! Oh! About that! Thank you so much for starting my summer holiday early! My sister will be visiting from South Africa around the time you have set to lock me out of my workplace and so it’s just perfect! We’ll have more time to talk about the differences between the education system there and the one here. She never could understand why, 24 years ago, I gave up 13 paycheques a year, 100% medical coverage and a housing subsidy provided to all teachers by the apartheid government. Between taking a mortgage holiday and using discount coupons provided by friends, I’m sure I’ll be able to show my sister many tourist spots in beautiful British Columbia, one of the richest provinces in Canada. I’m not sure I’ll be able to explain to her why it’s also the province with the highest child poverty rates, why a newspaper has an Adopt-a-School campaign or why our public education system is so poorly funded compared to other provinces. But I’ll try. Author Lizanne FosterPosted on May 24, 2014 Categories Education for the 21st centuryTags #Christyclarkslockout, Minister Fassbender, public education, underfunding9 Comments on Thank you Minister Fassbender! Now that the debate about the connection between emotion and learning is over, what does a 21st century teacher need to be able to do to ensure that her classroom is an emotionally safe space? A place where there is lots more laughter than there are angry outbursts? Notice how you do anger. What triggers you? Under what circumstances? Notice how your body signals that an angry outburst is about to occur. Channel anger in ways that do not damage, do not destroy relationships. Apologize when step 4 above fails..
Anger is an important emotion. It has had critically important functions through our human evolution. Its main purpose is to infuse us with energy so that we can fight for our survival. But the evolutionary development of anger was not without a few flaws. One of them is that the part of the brain that is engaged when we become angry works far more rapidly compared to the part of our brain that weighs and measures and considers alternatives: our pre-frontal cortex. Have you ever done something in anger you have deeply regretted later? An action that leads to regret is one that is done when you were in the middle of an amygdala hijack. The regret comes after the pre-frontal lobe has considered other options and realized that you had misinterpreted the situation and over-reacted. Although anger is an important survival emotion, it’s also a secondary emotion. It is always a cover for one or more of these other emotions: fear, hurt, sadness, loss. Feeling those emotions exposes the deepest core of our being, leaving us vulnerable, so we are not likely to do that as easily as we are to allow ourselves to become angry instead. Anger is a nice comfy blanket that hides our fear or hurt or sadness. No one can make you feel angry. You alone have access to the switch that triggers the cascade of chemicals that result in the experience of anger. So, no, that student did not make you angry when they did what they did. When you saw what they did, you interpreted their behaviour to mean something. That interpretation of their behaviour then led to the pulling of the anger trigger and when you yelled, you were in full amygdala hijack. But, there are ways to circumvent another hijack. When you know what kinds of things trigger you, when you know how your body signals that you’re about to be hijacked, you can take a deep breath or two. When you are first learning how to do this, it helps to walk away, out of the room for a bit. It helps too if you have a regular meditation and exercise routine. You are less likely to be easily triggered if you do. Even though you may learn all about anger, and what to do about it, changing the way you have been angry in the past is quite difficult to do. For a while, you’ll forget what to do far more frequently than you’ll remember. But you need to keep practicing because the only way out is through. You have to go through the learning curve. The golden prize at the other end is that, when you know how to control your own anger, you will be able to help your students do that too. You will also understand that when a student is being aggressive or angry it has nothing at all to do with you. They may have had a really bad evening at home and the very last thing they can handle is to produce an error-free paragraph or listen to you explain a poem. When you learn about your own anger, you will know just how really scared or worried or upset that student is underneath their anger. You will feel empathy. And when you model empathy in your classroom, you will be well on your way to creating a learning environment that is emotionally safe for your students. 19th century classrooms were ruled by fear and coercion. Students in a 21st century learning environment feel safe to express and experience a range of emotions because their teacher is attuned to students’ emotions and knows, both cognitively and experientially, how to respond accordingly. I was very excited to see the concept of “attunement” included in the OECD document that currently seems to be guiding the direction of education reforms in countries like Canada. But my excitement was followed by concern that this would be yet another great idea that dies soon after launch because of a lack of practical understanding of it. For those who would prefer an academic analysis of attunement, I recommend this paper by Heesoon Bai. This post will hopefully illuminate the concept in a practical way. Last year, through circumstances that were both serendipitous and synchronous, I was fortunate to participate in a three-day workshop with Victor Wooten, unquestionably the best bass player in the world right now. No, I don’t play the bass and have not played the piano since I was a teen! I felt quite comfortable in the workshop, not only because Wooten was very welcoming but also because there were a few of us there with no other instrument but our voices. Wooten is a master teacher and amazing to watch in action. One day during the workshop I watched in awe while he “taught” the concept of attunement without once mentioning the word. At that point he had been talking for a while and I suppose sensed that people were not fully getting what he meant. He went into the centre of the circle and called up 5 people, 4 who played instruments and one who sang. Without any further instruction, he began to play a bass riff. After about a minute, he nodded to one of the musicians who then began to play his instrument in harmony with the bass riff. After another minute Wooten nodded to yet another musician and then another and then to the singer. Each of the 5 people joined in, adding their instrument to the music, in complete harmony. And right there, before our eyes, an amazing piece of music was performed, a piece that had never existed before that moment. A piece that just emerged from the attunement of one musician with another. No one musician dominated the piece; each listened carefully to the others while creating sound that wove between, above and below each other’s notes. Teaching in a 21st century classroom is about being attuned to the “music” each of your students brings into the classroom and helping them to play their instrument well while at the same time playing in harmony with everyone else in the classroom. What is critically important to being able to do this is for the teacher herself to be attuned to her own music. To know herself well, to know her own strengths and to know where she needs help and support. The singer in that circle with Wooten had no idea what she was being called up to do in the centre of the room. She did however know what she could do. She also knew how what she did could complement what others were doing. She could not provide the same sounds that the bass or the saxophone did but this was true for all the musicians in the centre. Each could use their instruments as individuals but what they could create together, when they listened carefully to each other, was magical and more than any one could do. A teacher who is attuned to her students sees each of them as individuals and yet also part of a whole that is greater than the sum of the parts. Attunement is not about what usually happens when a group of musicians get together and one starts to play a known song and others follow along. It’s also not the same as when one musician dominates an impromptu piece, leading the others. Attunement requires a dissolution of the sense of separation between yourself and the other. It requires paying attention to something greater than you. Something that has to be felt to be truly known. Which is why I’m concerned that this concept is going to be ignored or downplayed even though it is so critical in teaching and learning. Teachers are most comfortable being “in charge” but to be attuned requires teachers to follow more often than to lead. Teachers who want to be more attuned to their students will need courage to step down from their positions of control and to bravely step away from being at the centre of the classroom, literally and metaphorically. I know how disquieting this can be and have previously written about my experience in a decentred classroom. But I also know that going through the discomfort is a necessary step to creating a learning environment for the 21st century.